OracleAS 10gR3, so OC4J standalone, is using the standard Java logging framework. Some of the benefits are easy configuration, and extensibility. 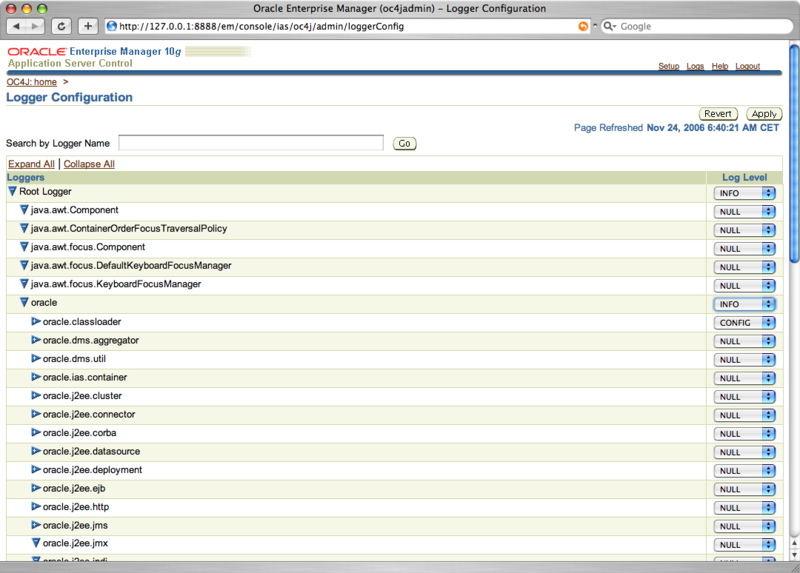 The configuration of the level of logging of the different loggers has been exposes in the Oracle Application Server Console. To see the logger configuration, click on the Administration Tab and then Logger Configuration, you can then configure the different loggers. By default the logger will write all the information in the default log.xml file, and for application lever logger it will go in the application.log. You may want to send the information in the console during development to debug/analyze your application. This is done using the configuration of the Handler. This information is currently not available in the Application Server Console, so I am documenting in the next steps how to send the information in the console (terminal window). by doing this you will see the SOAP Message in the OC4J console that is running in your system. You can also use this configuration with any loggers available in OC4J.